The “l” in the “ls -l” command output above indicates that the file is a soft link. 2. The size of the soft link created in the example above is the no of characters in the pathname (file), which is 5 (it can be absolute or relative). 3. If you delete the original file (file) the soft link render as useless. 4. Soft links can reside on different file systems. 5. You can create soft links to directories also. Every file uses atleast one hard link. So when you create a new file a new directory entry is created which is called link count. So when you create a new hard link to this file the link count increaments by 1. 2. The link count increases by one, everytime you create a new hard link to the file as shown above. 4. 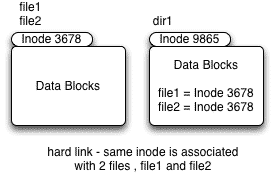 Hard links can not cross the file system. 5. You can not create hard links to directories.